brain injuries and a fractured jaw. She still has vision impairment as a result of the injuries, but has mostly recovered from the physical trauma. Arayza’s case was covered by local media and drew concerned citizens’ attention from around Kauai. Kauai Path’s leaders were also drawn to this case, and the educational non-profit proceeded to convene a Solutions Meeting in order to help prevent similar tragedies. In an effort to reduce the recurring incidents of travel related injuries and deaths plaguing Hawaii, the Hawaii Bicycling League (“HBL”) successfully appealed to the Hawai‘i State Department of Health’s Emergency Medical Services & Injury Prevention System Branch for funds to support Solutions Meetings on the neighbor islands. 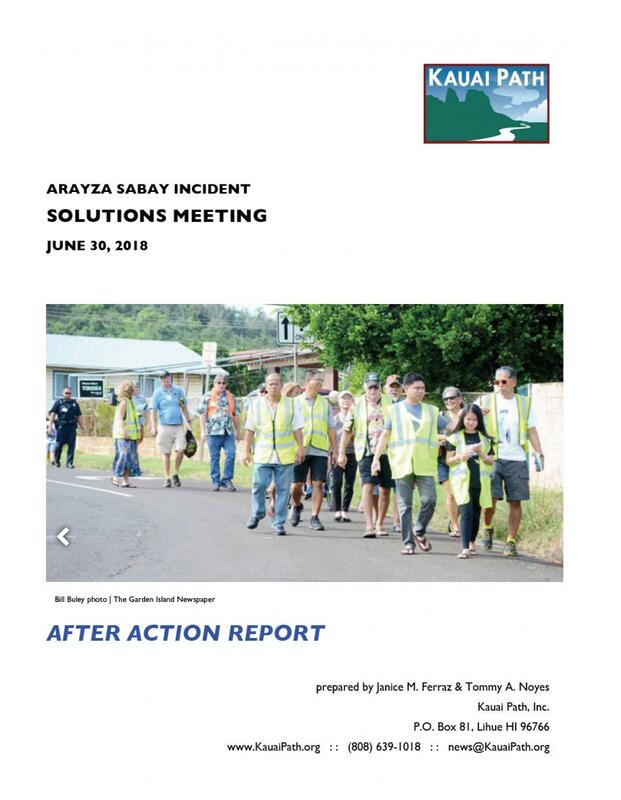 Click here to downlaod the 0.7 MB .pdf of the Arayza Sabay Incident Solutions Meeting After Action Report.